Wendy stood at the bakery shop window, her face pressed against the glass. She watched the other children standing at the counter buying ice cream cones, donuts, chocolate covered biscuits and cupcakes with raspberry jam and cream cheese filling. Her tongue moved across her lips, wishing for one bite of the sweet pastries. When she could bear no more she headed home. There she'd find her grandma and grandpa waiting for her. Her mother would come home later in the evening, exhausted and worn out after a hard day's work. She opened the front door and went inside. Grandma stood at the stove stirring a pot of stew. A tray of scones sat on the counter. “Hello Wendy. Did you have a nice day at school?” Grandma smiled and turned to give her granddaughter a hug. Wendy forced a small smile and went to hug her grandpa. He lay in a chair snoring. Wendy didn't disturb him, but went to her bedroom and lay on the bed. She thought of the kids at the bakery and wished that she could have a cake all to herself. That night she had a dream. She went to the bakery and Mrs. Fingal told her she could have anything she wanted. She could eat every single thing in the bakery. Wendy laughed and ate ten cakes and three donuts. When she woke up in the morning and realized it had only been a dream, she wept. Her mother walked by the room and heard her daughter crying. With a sigh she left her to sob and went to work. After breakfast Wendy went to school. On the way she saw something lying in the street. “What's this?” She held the stone up. “It's a ruby. At least it looks like a ruby. I wonder if Mrs. Fingal would let me trade this for a cake?” Wendy put the stone in her pocket and waited excitedly until school finished. She dashed to the bakery. When she opened the door and went inside the aroma of sugar and chocolate filled the room. “My name's Wendy and yes, it's me, but today I can buy a cake. I found this.” She put the ruby on the counter. “I found it lying in the street. Is it worth enough for a cake?” Wendy glanced at the baked goods. Wendy moved from one shelf to the other, pointing at cakes with cream icing, chocolate flakes, and jam spread on top. Mrs. Fingal put them in a bag for her. “Here. Why don' t you take a loaf of bread too.” She put it in the bag. Without asking any questions, he shoveled a cake into his mouth, savoring every bite. They feasted on white cake with apricot filling, cherry cake with vanilla icing and chocolate cake with fudge icing. That night Wendy and her family slept with smiles on their face. The next morning they had bread and butter and Wendy went to school, singing and dancing down the street. 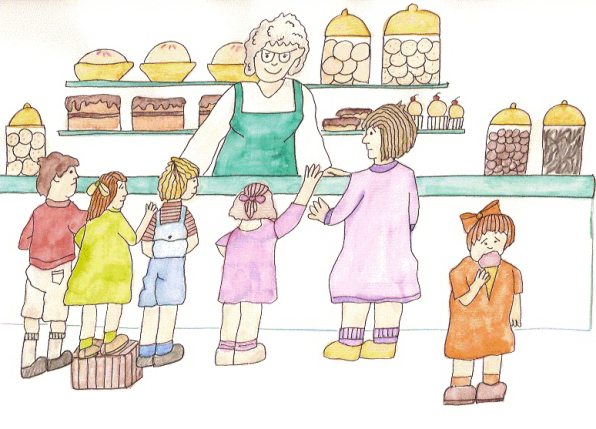 After school she stopped at the bakery and once again Mrs. Fingal let her choose ten things. She picked a jar of chocolate covered biscuits, an apple pie, an angel food cake with strawberries on top, a fruit tart and instead of getting more sweets, she chose five loaves of bread. Once again the family feasted and slept well. Every day Wendy found a stone and every day Mrs. Fingal let her choose things from the bakery and every night Mrs. Fingal went out and laid the glass jewels in the street so Wendy would find them. Never again would she have to watch that sad little girl staring in the window.